Customer Satisfaction is job one. Our number one job at Austin Native Landscaping is customer satisfaction. We work hard every day to ensure you receive quick and accurate bidding, clear and open communication, expert advice on improving Austin’s ecology and watershed and most importantly a beautiful new landscape to enhance your home’s value and comfort. Our goal is to provide our customers with a “One Stop Shop” to transform their unruly or high maintenance lawns into a relaxing and cost effective xeriscape they can enjoy all year round. Our team of designers, permaculturalists, irrigators, masons, and carpenters will work with you to incorporate your favorite plants and landscape features, into a long lasting, hard wearing, low maintenance Xeriscape for the whole family to enjoy. We strongly believe in quality over quantity. Our teams of skilled professionals work one job at a time, from start to finish, so our clients get 100% of our care and attention. Your installation crew will never leave your job to favor another customer. Our Designers draw on years of experience and formal training in permaculture and xeriscape planting to make sure every plant can get the water and sunlight it needs to thrive in the sometimes challenging Texan climate, and all our plants are guaranteed for one year from the date it was planted. Our specialty is designing and installing landscapes using plants and trees adapted to life here in Central Texas with minimal water, fertilizer, or maintence. Using Native plants in your garden or lawn not only means less work for you but helps protect and preserve our unique ecology by providing a refuge for native songbirds and butterfly’s whose habitats are disappearing. 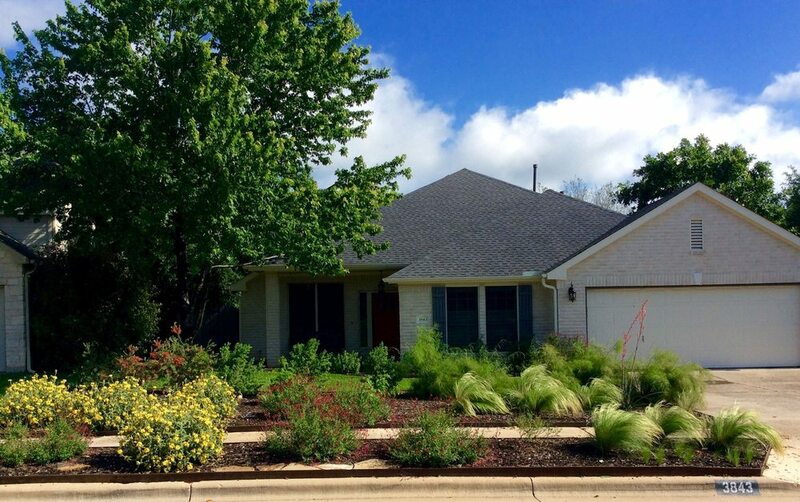 We provide high quality, drought tolerant xeriscape landscaping services using Texas Native Plants — implemented in a timely fashion and without breaking the bank. We love Austin, Texas; Xeriscaping and beautifying the community is our passion. To compliment the skill and experience of our Planting and xeriscape specialists, our Landscape construction crew, always builds to the highest standards available in central Texas. Our Masons select and hand cut every piece of stone to fit like a glove, and our carpenters select every piece of lumber for your project with a sharp eye for quality. All too often construction in Austin is concerned with speed rather than quality workmanship, but our Landscape Construction Crew makes sure our clients get only the best. At Austin Native Landscaping, we strongly believe in our shared responsibility to conserve Austin’s water and protect our watershed. With every design and Installation, we strive to use low maintenance perennial plants and trees native to central Texas. It is duty of everyone to keep this city healthy and beautiful, as well as weird. From plants that require little to no water, to subterranean drip irrigation, to permeable patios and driveways; we can help you do your part for the future generations of Austinites. The members of Austin Native Landscaping first met on small organic farm in East Texas. Brought together by the WWOOFing program, a passion for organic planting, and a love of the outdoors, the founders came back home to Austin decade ago to start a business that would let us use our creativity and skills help improve the ecology and beauty of our favorite city. Born in St. Petersburg, and raised Elat, Israel, Reed is a Texan by choice. After his service to his country, Reed traveled around the U.S. working for room and board on Organic farms and meeting new people. Once he came to Texas he knew he was home. Reed founded Austin Native Landscaping with three shovels, two friends, and one old truck and after a decade of dedication to customer service, passion for design, and a breadth of knowledge about the plants of central Texas, he turned Austin Native Landscaping into the success it is today. Reed believes strongly in his mission to use native plants and well planned xeriscaping to conserve Austin’s water and ecosystem. Formally trained trained in permaculture as well as low maintenance xeriscape design and irrigation Reed oversees the layout of all our projects to make sure every installation is efficient and functional as well a beautiful. A Native of Austin, and son of a carpenter turned teacher, Jarrett spent his youth working on a series of organic family owned farms across the Southwest, where he met Reed as well as his wife, Rebecca. After his marriage, he moved to Rebecca’s home in Bedfordshire, England while she completed her Masters in Sustainable Architecture. During his time in England, he apprenticed with the prestigious JP Brickwork of Ampthill, learning the ancient craft of English Masonry from some of world’s best bricklayers. After working for years as a “Brickie”, he returned home to Austin with his wife to pursue their dream of a farm of their own (and a decent breakfast taco). Jarrett applies the European standard of workmanship to all his projects; building for future generations, not a quick profit. A Texan born and bred, Andrew studied nutrition science at Stephen F Austin University, and is deeply passionate about a healthy lifestyle supported by organic fruits and vegetables. After years of knowledge and experience developing and managing organic farms in East Texas, Andrew is an expert on everything that grows in the Texas soil. Andrew is a wealth of knowledge on the health and maintenance of all the Texas Native plants used in our designs. It is duty of everyone to keep this city healthy and beautiful, as well as weird! Have a question? Need some advice? Ready to talk about Xeriscaping? We're here to help and excited to talk! Just get in touch with us from our Contact page, via phone, email, Twitter or Facebook.